I never understood the Shakespearean phrase, “beggars description.” I understand it literally of course. Some experiences or feelings defy words. These past two weeks have been intensively and sadly divisive. Grief, fear and shock have been fought over as though they are desirable currency. Who is entitled to these tarnished coins? Who can feel important feelings? The answer: anyone who does. 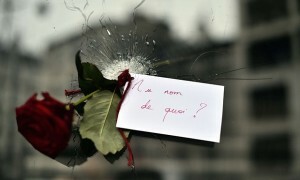 After the attacks on Paris from terrorists, some of my patients wondered if they “should” feel anxious about terrorism because their peers were not. College freshman feared they were not brave because they had nightmares. Some raised the issue of greater losses elsewhere and felt we “should” feel more for other countries. Many others were simply concerned about a science midterm or Thanksgiving break. Evacuating Harvard Yard made it hard to reach a professor with office hours. The omnipresent drone of a circling plane activated PTSD from 9/11 and the Boston Marathon attacks. I sat in my office like a shaken sphinx. I was full of questions. What was normal? What was pathology? Hard to know. I could not promise security to anyone. I could not reassure a patient that we were all safe. All I could do was continue to listen to each person’s response to another attack on the world. The responses were wildly different. None, however were hard to understand. My life has been spent putting words to feelings­. I have been a writer. I have taught others to how to write. Now I use words to cast a net over someone else’s experience. I search for a “common language.” The best words I can hear are “me too.” But there are never “no words.” If someone says “I don’t understand” or “I can’t imagine what you’re gong through” I feel alone. I want to say, well then—”try.” So this week, like others, I tried. Even when I urgently wanted to talk about the situation of the world, I tried. I listened when active listening was especially hard to do. In the carpool I explained these proverbs and poems to seventh graders. I quizzed my calm daughter on their meaning at night. What was I suddenly trying to transmit? Nothing she wants to hear— yet. Understanding, as John Green wrote about falling in love, happens like falling asleep, slowly and then all at once.” In therapy, months are spent visiting an experience or a relationship until suddenly, you see it from above. An X on a map. A discovery of perspective. You wrote, “Some raised the issue of greater losses elsewhere and felt we ‘should’ feel more for other countries.” Sadly true and insensitive to the fact that selective grief and outrage is normal. Grief is personal, and along with collective grief, is naturally biased toward those we collectively know best and with whom we have a shared history. “Selective outrage” arguments are just extensions of specious grievance and victim mentality —and attempts by people to politically spin tragedy to to their own purpose, Akin to the wave of campus snowflake protests feigning victimhood and outrage at racism — where protestors seeking “safe spaces” ignore historical context and themselves act in profoundly racist and divisive ways — those who advance “selective outrage” arguments ignore the fact that terrorism is always contextual. Moreover, they counterproductively divide us instead of seizing the opportunity to unify us in grief. The “selective outrage” arguments following the terrorism in Paris shifted our focus from acts to reaction in a way that gives the terrorists what they desire, the spectacle of the West and victims tearing at themselves. “These past two weeks have been intensively and sadly divisive. Grief, fear and shock have been fought over as though they are desirable currency. Who is entitled to these tarnished coins?” Perfect summation, “tarnished coins” is poetically precise.